The Baretta TV show was a 60 minute drama series on ABC about a cocky, street-wise, undercover New York city cop. He'd always get in trouble for breaking any rule necessary to bring in a criminal. Title: "Keep Your Eye On The Sparrow"
Written By: "Dave Grusin and Morgan Ames"
Performed By: "Sammy Davis Jr."
No, no, don't do it. ABC had originally wanted Robert Blake to take over the lead role on a TV series titled, "Toma". That series had not been particularly successful. Blake wasn't too thrilled about taking over an established role either so they ultimately decided to change the title to Baretta, the setting of the series was changed, and so were several other minor details but effectively, it was still a continuation of "Toma". Ed Grover appeared in five different roles in nine appearances on the series, "Quincy, M.E.". On the first two he played a doctor, on the 3rd and 4th he played a customs agent, then he returned as the doctor, and then he returned as the customs agent again. The final three appearances were in miscellaneous roles! Apparently, the episodes were spread out by enough time so no one noticed! 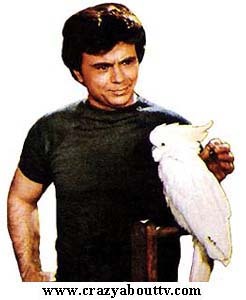 The Baretta theme song (see above) originally had no lyrics. They were added in later seasons. While Michael D. Roberts' character on Baretta was called "Rooster" which was obviously a nickname, it was once mentioned that his first name was actually "Quentin". Michael attended California Institute of the Arts where he studied with Barbara Bosson who played Frank Furillo's wife Fay on "Hill Street Blues". He founded an anti-drug education program aimed at young people called, "Right Track". He was born on Christmas day in 1947. Dana Elcar was replaced by Ed Grover at the beginning of the second season of Baretta because he and Robert Blake didn't get along. Don't feel too sorry for Dana though. He was one busy guy after that with 63 acting credits between 1976 and 1985. Then, in 1985, he landed the role as Pete Thornton on "MacGyver". That role lasted for a whopping seven seasons! Dana had a body double on MacGyver named "Don S. Davis". In case you don't recognize the name, Don would later land the role as "General Hammond" on "Stargate SG-1". Robert Blake nearly landed the role as "Jim Rockford" on "The Rockford Files" but that series' creator, "Stephen J. Cannell" was afraid that Blake's small body size would make him seem like a coward. You see ... Jim Rockford would not get physical when dealing with criminals unless he had absolutely no choice! James Garner who ended out getting the role was a big guy who came off as smart for finding some way to catch crooks without risking personal injury. The first TV show that Robert Blake got a role on was "The Adventures of Wild Bill Hickok". Believe it or not, he played an Indian named "Rain Cloud". By no means was Blake new to show business at that time though. He had already appeared in 92 movies by that time! Thank you for visiting our Baretta TV show page!